Regarded as one of Ireland cricket's most trusted servants, 34-year-old Kevin O'Brien has represented his country in 185 international games, where he has scored 3986 runs. 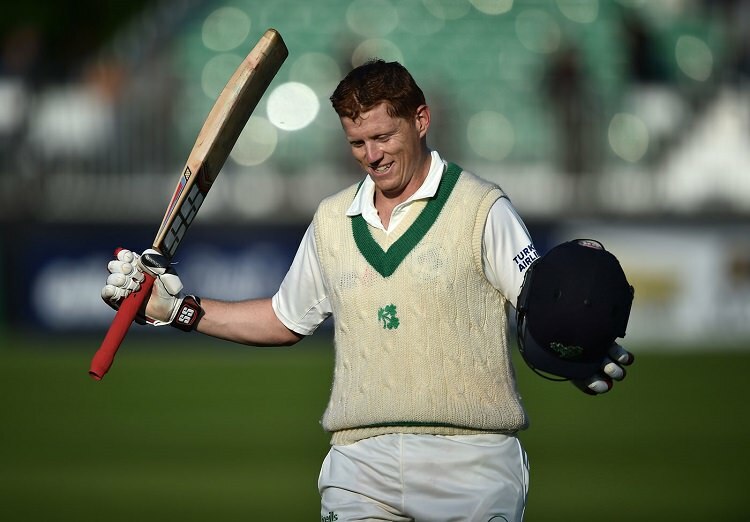 He recently had the honour to become the first Irish player to score a Test century which he completed under difficult circumstances in the historic one-off Test against Pakistan. In an interview, Kevin O'Brien, spoke about the Ireland's historic first Test match against Ireland and what it means to become the first Irish player to score a Test century, if cricket can grow in Ireland to become a main sport, what it was like to face Mohammad Amir, his thoughts on Shadab Khan and Imam-ul-Haq, Pakistan's chances in the Test series against England, why he feels that more nations should be given an opportunity to play in the ICC World Cup and how Ireland can carry on the momentum by playing more Test matches home and abroad. PakPassion.net: What was the mood in the Irish camp like ahead of the historic Test match against Pakistan? Kevin O'Brien: It definitely felt more than just a game of cricket and this feeling started on the Tuesday when we met for our first training session. You could tell that this was something different and not just another game as there was a different level of intensity, which was because there was much more riding on this game. This was obviously a huge game for the Irish cricketing public as we were going forward onto the road to Test cricket. I hope that we can have many more days like what we experienced in Malahide in future too. PakPassion.net: There must have been a few butterflies in the stomach as you walked out onto the field ahead of the national anthems? Kevin O'Brien: As one would expect, there were butterflies in every team member’s stomach as we walked out on the field. Of course, there was a feeling of pride for us after the presentations at the start of Day two which happened in front of our friends and families. But, yes there was definitely plenty of butterflies and nervous energy floating around in each and every one of us at the start, so it was a relief to get the first ball in and to get the game up and running. PakPassion.net: How does it feel to be the first man in Irish cricket history to score a Test century? Kevin O'Brien: I would say it's a pretty cool feeling. When I was growing up in Ireland, I never dreamed of playing a Test match for the country, let alone scoring a Test century. It's wonderful to have my name on the temporary honours board at Malahide. Hopefully, when we get our new stadium in Abbotstown in a couple of years then there will be a permanent honours board and my name will be up there as well. PakPassion.net: Do you feel that your innings could inspire the next generation of young cricketers in Ireland? Kevin O'Brien: It's taken a few days but the magnitude of the innings has slowly sunk in and what it could lead to, in terms of inspiration for up and coming young cricketers. At the time when I scored those runs, I did not realise how big this achievement was. But, after the match once I thought about it a bit more then the penny dropped for me and I realised how important this innings was. PakPassion.net: Do you believe that cricket can grow and become one of the main sports in Ireland? Kevin O'Brien: I think it can as I feel it has grown a lot since 2007 till now, based upon the success of our World Cup form and our World Cup victories over the years. With this Test, we have now entered a new chapter for Irish cricket. We had the beginnings to our success story back in 2007 with the victory against Pakistan in Jamaica, then we had the middle period where in the 2011 World Cup we beat England and finally in the 2015 World Cup we put in some good performances including a victory against West Indies. Now we have the start of the Test era for Ireland and hopefully young kids playing in local parks or back-gardens will start dreaming of playing Test cricket for Ireland. They will be dreaming of taking 5 wickets or scoring a 100 on their Test debut and with such aspirations, hopefully in the next 10-15 years’ time we will see a huge influx of new players playing the game as a result of the kind of match we saw in Malahide recently. PakPassion.net: Going into the 5th Day, you must have thought you had a chance of victory against Pakistan? Kevin O'Brien: That is definitely the case as first of all not many Test matches, these days, go into the 5th day although the first day being washed out did contribute to that. Also, with Test cricket nowadays, it's pretty rare to have a situation where all results are possible on the last day of the match. Going into the 5th day morning, we had a lead of 139 runs and we knew if we could get a 180 to 200 run lead, we had a great chance of getting stuck into Pakistan and knocking them over. Unfortunately, we only got a lead of 160 but at the same time we had them on the ropes at 14/3. I suppose one can say that if we had scored an extra 20-40 runs then it might have been a different outcome to the game. PakPassion.net: Whilst there were a lot of positives from this game, were you as a team a little deflated after the loss? Kevin O'Brien: Reflecting over the game from a team and a personal point of view, there are definitely encouraging signs and there are huge positives to take away as well. But of course, there is a little bit of disappointment and a ‘if only’ kind of a feeling as well. We certainly had a great chance to draw the Test and I feel that we had the opportunity to win the game too. Going into the final day, a draw did seem to be the most likely result given the stage of the game and the weather forecast. Also, at times things didn’t click for us and we also took a few wrong decisions, which can happen, at some crucial times as the day progressed. I think there were 4-5 such crucial moments where we didn’t take the right decisions and we lost the advantage and allowed Pakistan to get over the line. PakPassion.net: The fact that Ireland competed well with Pakistan must give you optimism for the future? Kevin O'Brien: There were concerns that the match against Pakistan would end with a one-sided heavy defeat for Ireland which were probably justified. I feel that cricket fans in Ireland and probably around the world were not expecting the game to go past the 4th day, let alone stretch to the final day. So, it's very positive from the team’s point of view to see the fight and character we showed as well as our determination to fight for every ball we played. To me, this showed that we can dig deep and are a talented team in 5-Day cricket as well in 50 Overs cricket. Yes, it was an important game and we lost the match, but it was encouraging from a team and individual’s point of view as we now know that we can compete at this level. Whilst we proved that we are comfortable at playing this level of the game, going forward we just don’t want to be comfortable but also want to win games. Like we showed against Pakistan, we want to be pushing the bigger and better teams and would like to challenge them going forward. PakPassion.net: What was it like facing Mohammad Amir at Malahide? Kevin O'Brien: Mohammad Amir is a quality bowler. He swings the ball both ways from over and around the wicket. He has slippery pace, although I feel he is not as fast as he was a few years ago and he does seem to have a knee injury as well. Having said that, he has such good skills with the cricket ball that even if he is only running in at 80-85% effort, he is still a handful. If Pakistan want to challenge England in the series, they need Mohammad Amir fully fit and they need him firing on all cylinders with the new ball as well as with the old ball when it starts reversing. PakPassion.net: Your thoughts on Pakistan youngsters Shadab Khan and Imam-ul-Haq who impressed many observers? Kevin O'Brien: I have seen a bit of Shadab Khan before as he has played T20 cricket in a few tournaments around the world and he is playing really well at that level. At the domestic T20 level he had a good PSL and its good to see him bring that form into international cricket as well. He has 2 or 3 tricks with the ball and is also a very capable middle to lower order batsman and he showed us those batting skills in the first innings where he got 55 against us. He is definitely a promising sign for Pakistan’s future. Yasir Shah is usually the number one choice leg-spinner but he is out injured so it's great to see the depth of talent in Pakistan cricket in the spin and the pace departments. Imam-ul-Haq looked very comfortable in the second innings. He is a gritty left-hander and he has 3 or 4 strong areas which he looks to play in. Once again, if Pakistan are to compete well against England they will need a good start to their innings and Azhar Ali and Imam-ul-Haq will be vital for that objective. Against James Anderson and Stuart Broad, it's not going to be easy at Lord’s and Headingley so Pakistan will need a good start from their openers to get them through the first 15 or 20 overs. PakPassion.net: How painful is it to not see Ireland’s name in the list of 10 teams for the 2019 World Cup? Kevin O'Brien: It’s not an ideal situation. In the 2007 World Cup there were 16 competing teams, then in the 2011 World Cup this was reduced to 14 teams and the same number of teams participated in the 2015 World Cup as well. It’s disappointing from our point of view that ICC have now reduced the number of teams to 10. You have so many talented cricketers in the world and so much talent in the countries such as ourselves, Zimbabwe, Holland, UAE, Nepal and Papua New Guinea. All of these teams have very good players who play good cricket and these teams are also fast improving as well. Despite the disappointment of not having qualified for the 2019 World Cup, we are very happy that we are part of the Future Tours Programme. So, we will have regular games now such as ODIs, T20Is and hopefully we will have more and more Test cricket too. It's encouraging that we are part of the FTP but participation in England in the World Cup next year would have been the icing on the cake, but at least now we don’t have 4 years of wilderness between qualifying for World Cups. PakPassion.net: How important is it for Ireland to continue this momentum and play more Test cricket, both home and away? Kevin O'Brien: Yes, its hugely important that we continue this momentum into the future as well. We have always been knocking on the door in 50-Overs cricket and have been playing regular games against some of the bigger teams. So, now we need more Test matches against teams that are touring England, so instead of playing an English County for a warm-up game, they can come over to Ireland and play a Test match before the series kick offs against England. We also need to go overseas and get used to playing in conditions that we are not used to, so we can play in places such as Zimbabwe, UAE or India. For now, we need to focus on playing Test cricket with the likes of Afghanistan, Zimbabwe, West Indies and maybe Sri Lanka and Pakistan and not really focus on the top 4 or 5 teams for the moment. I think we can do this until we find our feet and get comfortable playing the 5-Day format. Once we are comfortable playing Test matches and have a few wins under our belt then the confidence will be high in the group then we can handle some of the bigger teams. This is my view and also the opinion of the Board as well, which is for now to play the likes of Afghanistan, Zimbabwe and West Indies on a regular basis.